Encourage customers to complete checkout. Increase your conversion rate and attract more new customers from social networks via friends’ referral. Exit intent technology to prevent cart abandonment. UX-UI optimization to the best, no coding required!. "Do you think that reaching 25% conversion rate with just 1 app is possible?" Why should I use Checkout Boost? Did you know that 74% of consumers rely on social networks to guide their purchases? Realizing its potential, we introduced the Checkout Boost app to encourage shoppers to complete their cart, and naturally refer new customers to your store on social networks. Checkout Boost’s customers have seen amazing results, with 25% conversion rate and $10,000 extra revenue in just a month! 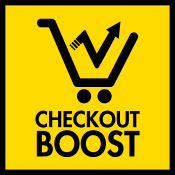 How does Checkout Boost work? Super easy to install and customize your offer. Increas­e the quan­tity and quality of the customer's order. Improve customer satisfaction by helping to find the product or service that best meets your visitor’s needs. Beautiful holiday themes of pop-ups to drive up your sales during holiday season. SUPPORTS MULTIPLE LANGUAGES & CURRENCIES. Contact [email protected] for support within 24 hours.